There have now been three Sunday evening Masses at the church of the English Martyrs in York. The first two were celebrated by Fr Stephen Maughan and the third by Fr Alex Redman. Fr Redman is a priest of the Clifton Diocese, but working full time as Catholic chaplain to Wakefield Prison. He has free time on Sundays and has volunteered to say Latin Masses whenever he is available. So we will have backup for the occasions when Fr Maughan is away. About 40 attended the first mass, but the numbers were down a little at the following ones. The problem in one of publicity. It seems that very few people know about these Masses. 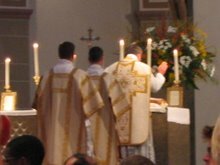 I have asked the parishes in the York area to include an item on this Mass in their newsletters; but, so far, I am not aware that anything has appeared. For the first Mass, I arranged for an item in the local paper, which probably accounted for the larger number. I have sent information to the diocesan newspaper, Catholic Voice, but this will not appear until the December issue, due to the lead times. Does anyone have any ideas of how to spread the news around? Rorate Caeli has reported on an opinion poll conducted in Italy by one of that country's leading polling organisations. I understand that the results can be considered reliable. Apparently, three questions were asked. 1. Are you aware of the motu proprio, summorum pontificum, by which Pope Benedict XVI approves both forms of the Roman Rite? 2. Would you find it normal to have both forms celebrated in your parish? a) at least once a month? b) at least once a week? These are all remarkably high percentages. I would guess that if the same questions were asked in England, the figures would less than half the Italian ones. However, this is only my guess. It would be interesting to see the results of a similar poll conducted here. 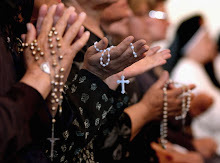 The most significant result is the one that found that 63% of practicing Catholics would attend a usus antiquior Mass at least once a month if there was one in their parish. This must surely be a compelling argument for provision of at least some older rite Masses in most Italian parishes. The result that as many as 71% of Catholics would consider this normal, would seem to suggest that opposition amongst parishioners would be minimal. Another result that I find surprising is the level of awareness of summorum pontificum in Italy. Of course, being aware of the existence of summorum pontificum is not the same as knowing exactly what it decrees; nevertheless, 64% is a remarkable figure for a country where there is no equivalent to the Latin Mass Society, and very few old rite Masses are celebrated. Yesterday, Fr Stephen Maughan celebrated his first Mass in the Usus Antiquior, and he did it very well. From now, at least until Christmas, there will be a Low Mass at 6.30pm every Sunday at the church of the English Martyrs in York. Fr Maughan will be the usual celebrant. About 40 attended yesterday, which was quite good since it is nine months since the last Latin Mass in York. Interestingly, many of the congregation were people that I had not seen before. In the other hand, some who were regulars last year were not there. Hopefully, the attendence will build up so that there are enough for this Mass to continue indefinitely. Please pass on information about this Mass to anyone you know who might be interested. I think that we can be well pleased with the Holy Father's choice for the see of Birmingham. It was announced today that Bishop Bernard Longley, Auxiliary in Westminster, will be moving to the Archdiocese of Birmingham. Bishop Longley is considered orthodox, and is known to be reasonably sympathetic to the traditionalist point of view. He is also well educated, having an Oxford degree. This is an imaginative appointment, bypassing several bishops who are already ordinaries in their dioceses, and might have considered themselves ripe for promotion.